The chance did not exist easily though I wanted to breed a Japanese bee before. The breeding box and Symbidium for a Japanese bee were prepared. Because the chance had come in the spring of 2010, bee's page was made. The bee used to keep bees in our country is the West bee imported at the Meiji era now. 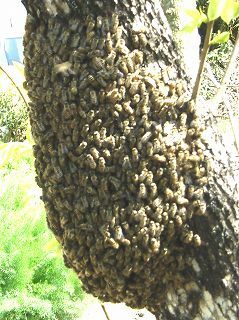 Because the West bee doesn't have the defense means to a vespine attack of autumn, it is said that it is difficult to survive in the wild even if dividing is done. It is usual that the West bee doesn't have the means that only being kept in the box in the nest that man prepared survives. However, the ability to collect honey is high, and very excellent as the domestic animal. Dividing of gathers in the tree near the bee's house for several hours - two days and makes bee's ball. It searches for the place where the scout bee becomes new those who live between those. When a suitable place is found, it moves all together to the place. To capture a Japanese bee, this bee's ball is put in the bee's house. Putting the bee's house that is called a waiting box to be near is effective of capture. Dividing of bee had already been captured in this house several days ago. I challenged capture for the first time. I had a box under bee's ball by the left hand, it dropped by the right hand with a bamboo stick, and slide down and bee's ball dropped in, there was only a cardboard box. The box top was closed as it was, the cardboard box was made upper and lower and inverse, and it took it home quietly by car. Time when capturing it directly to the bee's house moves the bee again can be saved in reality. Moreover, it is possible to capture it also with the net of the dustpan. The bee distributes at about five minutes though the remaining bee becomes bee's ball again even if it captures it. It captures it again because there is a possibility in which the queen bee exists in that when not distributing it. At this time, the shirt extended the sleeve wearing only the hat because there was no side cloth of the net. Still, a Japanese bee stayed in surroundings of the face, dividing, and eyes. It has left the place at once without doing anything because it knows the pierced thing when touching and paying. Never piercingly. A Japanese bee never stings it on the belly if there is no great thing at dividing of bee and that time after making honey full. Please note that it might be piercing because it doesn't have a large dividing of honeys in the belly if it is in a bad mood when usually living in the bee's house.